2. Quitugua and Cristobal removed. Patience my foot. He has had over a year and a half to assess. Just more talk as usual. Don't be satisfied with apuron resigning; REMOVE the pervert! No worries. We will not settle for his resignation. That's just the prelude. Stay tuned. Tim, patience is a virtue.... unless it has been almost two years. Careful... to show opposition to His Grace is to go against the Holy Father! consulting, reflecting, unity, harmony, and stability all sound simple. We had them all once? Archbishop Apuron, where did to consulting, reflecting, unity, harmony, and stability went to! Addressing and fixing consulting, reflecting, unity, harmony, and stability have you all forgotten the Victims and what they've been through. It's a crime. John Wadeson ( incardinated) sent a lovely message that he is WITH THE BROTHERS in the struggle. Clap, clap, clap, brother John. This letter is not worth the paper it is printed on. Archbishop Hon, you need to wake up, and stop taking us for a bunch of demurred children. You have been here for a whole week, and have done close to nothing. 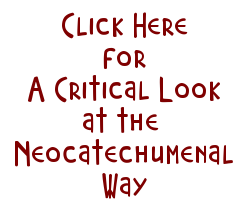 Since the whole administration of the diocese is in the control of the NCW, which is at the root, of every issue this Church is facing, you have been meeting with the problem, it is starring right at you. Are you blind and deaf? Archbishop Hon, you have failed to even notice the families of the victims. You have not been charitable or even tried to be towards them. What are you waiting for? Their departure? 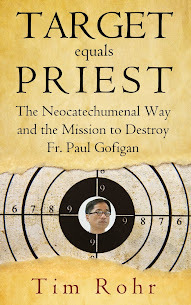 You have not met with the diocesan priests from Guam. To add insult to injury you participated, and as such gave your seal of approval to the fundraiser for the fake seminary. Your actions are neither pastoral, nor loving. You basically declared war on the faithful of this Diocese, by continuing to let yourself be subjected to the failed administration of the Chancery. You are willingly being the captive of a small, evil, active and totalitarian minority. You had a whole year and a half to prepare yourself, the only thing you can tell us is patience? Our answer is: BASTA. This is enough! We have refused to take this abuse from Apuron, we certainly are not willing to take any from you. 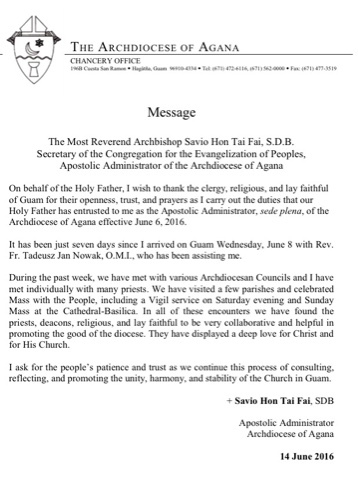 Archbishop Hon: Guarantee me and guarantee the people of Guam that AAA is innocent. That's all I want and I'll surely wait on your respond and answer. Until then, the Law of the Land has taught me to keep my grandchildren away from AAA for their safety. I believe you yourself would protect children from those whom are accused with sexually abuse them until found innocent. Wouldn't you? God gave me the brains, I have to use it. Guarantee me! As an active though silent member of CCOG member, I urge everyone to stay the course. We have arrived at this point not because of Rome's leadership but because of dedicated individuals who have sacrificed so much to uncover the truth about the sad affairs of the church on Guam. Do not think for a moment that Rome will bring the serenity and unity we've been waiting for. They had nearly two years to do it.